How to Prevent Sink Water from Draining Into My Dishwasher? A standard sink and dishwasher design should enable a kitchen sink drain and dishwasher drain to work efficiently together. When your kitchen sink is found to be draining into your dishwasher, you’ve got either a clogged drain, or something in the design is problematic. Knowing what causes this will help you correct the problem and prevent further occurrences of the issue. Sink water flowing into a dishwasher is a health hazard, so this needs to be addressed as a priority. Benjamin Franklin Plumbing in the Bay Area recommends getting professional help. We are quick, experienced, licensed, and reasonable. Clogged drains, incorrectly installed garbage disposals and misrouted dishwasher drain hoses can be frustrating for the DIY homeowner to resolve. Our plumbers are trained to think with the whole system, plus, we have seen it all: every possible way plumbing fixtures may have been wrongly installed, all kinds of corroded or missing parts most people wouldn’t think to look for, and how clogs can appear in unusual places. There are several areas to check to figure out why sink water is draining into the dishwasher. The dishwasher drain hose may not be installed correctly or it may have been accidentally pulled down to a lower center of gravity. The drain hose starts at the bottom of the dishwasher and loops up to a higher point than the kitchen sink drain, and then comes down to connect to either the kitchen sink drain, or the garbage disposal. The reason for the loop is so water draining from the kitchen sink cannot drain back into the dishwasher. Water follows gravity and the loop prevents backflow. Water exiting the dishwasher is driven by a pump, so it can be sent “uphill” through the dishwasher drain hose loop and into the sink or garbage disposal waste line. But this hose is often exposed under the kitchen sink cabinet and if it was not adequately initially secured and the loop falls to below the point where it connects to the sink or disposal. If this happens, it is only a matter of time before water from the sink finds its way into the dishwasher drain hose and flows into the bottom of your dishwasher. Some dishwasher drainlines include an air gap. It usually looks like a silver cylinder set close to the rim of the kitchen sink near the faucet closest to the dishwasher. This air gap creates a section of air in the dishwasher drain line hose loop to prevent dirty sink water from flowing back into the dishwasher. If you have one and are still getting backflow into the dishwasher, either the pressure generated from clogs has overcome the air gap installation may be defective and need to be declogged, repaired or replaced. A lot of food and food byproducts such as fiber and grease can find its way down kitchen sinks or is thrown down garbage disposals. Over time, drains can clog, sometimes frequently. When there is a clog in the line, water pressure in the pipes can increase and force sink water up into the dishwasher drain line. One way to relieve the pressure is to disconnect the sink trap (P trap) underneath the sink and remove the blockage, or if it is not clogged there, run a snake into the waste pipe leading into the wall behind the sink. Of course, you’ll need a bucket to catch the water and the clogged material that may come pouring out. Often, an easier solution is to plunge the clogged sink drain to break up the clogged material and force it along the waste line where it can move freely away. Using a plunger greatly increases the pressure in the line which can defeat the air gap, even if you are plunging to remove a clog and there has been no backflow into your dishwasher. To be safe, the dishwasher drain hose should be clamped shut where it meets the sink’s drain pipes. It could be that the water that has back-flowed into the dishwasher is not from the kitchen sink but actually originated in the dishwasher line. This should be suspected if there are no other clogs present. Food debris and grease that is cleaned off dishware can pass through the strainer at the bottom of the dishwasher and form sticky clumps that jam the drain line. When the waste water from the dishwasher is pumped out until it hits the clog and then flows back into the dishwasher. Of course, large chunks of food may be accumulating on top of the strainer over the drain. To handle this, you have to loosen the the drain hose clamps and remove the hose and run a strong stream of water through it until it is clear. The dishwasher strainer is in the floor of the dishwasher and is easily removable for periodic cleaning. When lifting out the strainer, check beneath where it sits for any gunk that got through. It may seem unlikely to you, but if you have a new garbage disposal and are getting wastewater backed into the dishwasher, it may be that someone left the plug in place in the port where the dishwasher drain line is coupled to the disposal. This happens more times than you might think. Remove the rubber drainage tube from the side of the disposal after unplugging the disposal from its electrical source. Then probe inside the port with a screwdriver for a plastic plug. If you find one, simply remove it and the draining issue could be resolved. 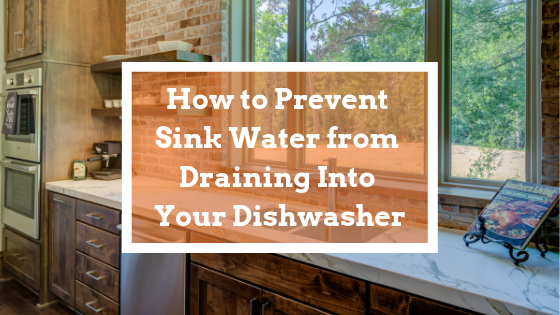 It could also be the case that waste from the dishwasher has traveled up from the drain line into the disposal and clogged it enough that it now sends waste water back to the dishwasher. This can happen if the strainer has not been cleaned out routinely. It may also be that the disposal is clogged from careless operation, such as putting too much food waste into it and not properly flushing it when it is turned on. Can a Clogged Pipe Cause a Leak?